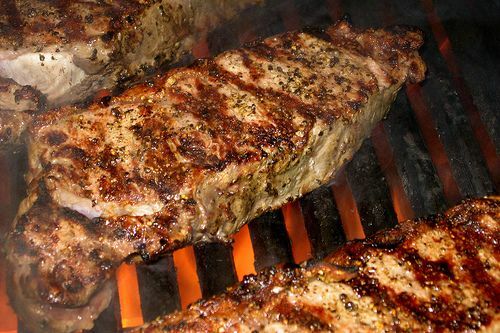 What's the best neighbourhood steakhouse in your town? By "neighbourhood", I also mean comparatively family friendly prices as opposed to "downtown" prices. So a Morton's or a Ruth Chris' Steakhouse in a suburban mall would not fit my definition of "neighbourhood". And of course I don't want any national chains anyway. Out here in Suffolk county on Long Island, I'm partial to PG's Steakhouse on Jericho in Huntington. Modeled after Peter Luger's menu and not overly attentive service but not a bargain either. I guess you get what you pay for. It is a lot closer than driving to Brooklyn. When I worked in Hoboken NJ 15+ years ago, I used to really enjoy Arthur's. Something about a steakhouse that put a bowl of pickles on the table and served liter mugs of beer. Ruined my work ethic in the afternoon though. I see they are no longer in Hoboken (now Morris Plains) and have no idea if they serve the same good fare. Amen to Arthur's as a neighborhood steak joint! How would you like your potatoes? ...because we only serve them one way! That's how you'll have them! My mistake, I thought you couldn't put it on the internet if it wasn't true! Anyone else hate that State Farm commercial? Seems there are now a couple of Arthur's in NJ (N Brunswick, Morris Plains, Hoboken); how do they compare? They don't 'share a common web site so I wonder. North Brunswick seems to have 2 different web addresses for the same place, really odd. And the potatoes are the 'Arthur's Famous' type. All of the Arthur's are like Elizabeth Taylor & Richard Burton. They're together. They're not. Everyone just stops paying attention to the break-up and make-up. It's a good fun casual local Roadfood steakhouse. It's certainly fun! The biggest factor to Arthur's is location. Where it is may lead some to think it's Peter Luger of <<<Hoboken>> and they cry about it and go on and on (using NYC prime as a measure) when it's a red & white tablecloth pickles on the table one kind of potato local place....serving good food. Roadfood! I haven't been there in about a year. I'm due! I Knoxville, TN it is Ye Olde Steak House on Chapman Hwy. It has been there for better than 44 years and you can get any size steak you wish. I have been there many times and it is consistently very good. Omar's here. Been around since 1949 or so. Lot's of fresh seafood too. We have a lot of family-owned supper clubs in the Twin Cities, as well as the iconic Murray's and Manny's which are high-ticket locations. I love Murray's, but it is definitely a splurge. I've been to Mancini's a few years ago for a wedding rehearsal dinner. Place was interesting but can't say a lot about the food considering we were part of a large group. Are you familiar with a place in Roseville called Lindey's? When I was working for Univac over 30 years ago it was the place to go when we had to visit 'the plant'. My kids used to go to St Elmo's in Indianapolis for special occasions but I've never been. I had also liked Bones in Atlanta but that was a lifetime ago as well. I'd like to nominate a nice place in Emmitsburg MD but I don't recall steak on the menu. Even though I grew up in Indianapolis, I've never been to St. Elmo's. When I go back home to visit, I often see an old friend from Kokomo, who raves about St. Elmo's -- but we always end up at Hollyhock Hill, primarily because we usually meet for a late Sunday lunch. Never been to, or, until now, heard of Lindey's. I'll have to check it out. Here in McKinney, TX, USA Today's "Second Best Place to Live in America" - (and the best place that does not have any state or local income taxes!) we are blessed with Rick's Chophouse ( http://rickschophouse.com/ ). It is truly a class joint and is Mrs. Metro's and my favorite local restaurant. In fact, I look forward to seeing Phil & Amy Mickelson dining there one day soon! This place: http://www.realtor.com/realestateandhomes-detail/4005-Quail-Ridge-Dr_Mc-Kinney_TX_75070_M70833-03908 is, I am sure, as nice as their present San Diego digs and is presently available at less than a third of it would cost in Cali. And McKinney has its own Gulfstream-laden airport, Cooper Clinic, and TPC course. The East is still "my home". The Steelers have more class in their little toe-nail than "the local team". We still keep a place in McLean from which I appreciate as I had never before the height of the trees and the green of the grasses; the D.C. Metro, the true intent of the Mall, and the Acela-access to The City, which is truly the greatest on Earth. I love the Pine Club, in Dayton, Ohio. I get to go once a year, in April. Forget it. I had too much fun today. I remember Little Jack's. Good place. Sad to hear that it's gone. I usually end up in Dayton once or twice every year for work. When schedule allows, I love hitting up the Pine Club. -- but we always end up at Hollyhock Hill, primarily because we usually meet for a late Sunday lunch. Hollyhock, great chicken as I recall. We hosted our son's rehearsal dinner there. I lived in Dayton for about six years the Pine club was a regular stop.I have also eaten at Ricks in McKinney. the Pine club is my plck. In Covington Ga. It's Jim Stalvey's which is featured here on Roadfood. The steaks and everything else are very good. They are also known for their lunch specials. I'm kind of partial to the Texas Land and Cattle Company. This place is a Madison tradition. Family owned and still the best in town in my opinion. We have ONE locally owned steakhouse in our area that's not a chain and it's in Alachua, FL. Conestoga's www.conestogasrestaurant.com. We are severely lacking in the beef serving industry. We usually end up just grilling ourselves.